Shared the trail this morning with a tarantula. Don't see many at the park and the few I have seen were usually in a Roadrunner's beak. Temps started in low 80's and ended in low 90's. Cloudy then sunny, light Southerly breeze. Quiet day for a hike. Park personnel have groomed all, or at least major portions, of the mentioned trails. This caused increased ant activity as the leaf cutter/red ants were working overtime to removed the cut grasses off "their" trail. 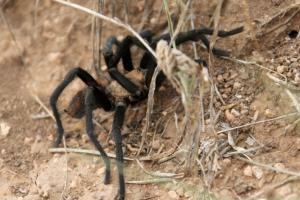 Saw two fairly large white tail deer, a tarantula (first in quite awhile), no snakes and the usual birds. When the wind died down, the gnat activity markedly increased - no fun!